Over the past few months, Uptown Cincinnati and the many businesses and organizations who call the neighborhoods home have garnered significant national media attention. Check out the stories below to see the world-class medicine, innovation, entrepreneurship and partnerships happening in Uptown. Cincinnati nonprofit MORTAR was recently featured in Forbes for its work in Uptown, Over-the-Rhine and Walnut Hills. MORTAR supports entrepreneurs in redeveloping communities to help residents participate in the neighborhoods’ growth. The Forbes article and accompanying video feature MORTAR founders Derrick Braziel, William Thomas II and Allen Woods discussing their work, motivations and vision for the future. 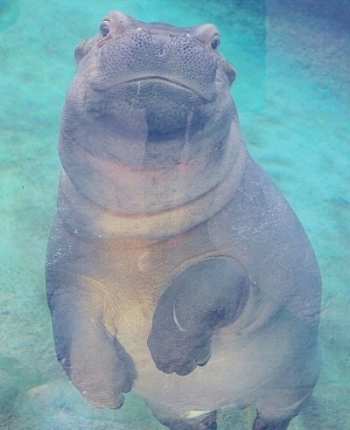 It’s no secret that Fiona the hippo is an international social media phenomenon. In the past few months alone, Fiona has been featured in tens, if not hundreds, of publications, including major national names like The New York Times, The Washington Post, HuffPost, People, U.S. News & World Report, CBS News and USA Today. The world can’t get enough of Fiona, and neither can we! We’re proud to have Fiona and her amazing caretakers at the Cincinnati Zoo & Botanical Garden right here in Uptown. Cincinnati Children’s Hospital Medical Center made national news in People when it welcomed a new facility dog to the medical center. Idina is the third full-time facility dog at Cincinnati Children’s, joining Chevy and Leica in providing comfort to the hospital’s patients. Learn more on the Cincinnati Children’s blog. Nicholas Newman, DO, MS, FAAP, Medical Director of the Environmental Health and Lead Clinic at Cincinnati Children's, and Kim Dietrich, Ph.D., Professor and Director of Epidemiology and Biostatistics at the UC College of Medicine, contributed to a USA Today story about lead and a lead diagnostic test recall. As lead experts, Newman and Dietrich were quoted in the story discussing the importance of lead testing. U.S. News & World Report ranked eight University of Cincinnati bachelor’s and graduate-level online programs among the best in the nation. The Cincinnati Business Courier summarized the different rankings, which includes the Criminal Justice graduate program in the top 10.